After a long, beautiful fall and temperate early winter, cold temperatures have made their way to the midwest. I remember as a kid, my mom always pushed a warm breakfast on cold mornings. This recipe comes from my friend, Mags at The Other Side of 50. She tells the best stories and shares fabulous recipes. A few Sunday's ago, I opened the egg carton to find I had only one egg. Okay what to make for breakfast? I remembered Mags recipe and had a cup of leftover pumpkin. I substituted honey for the maple syrup and used cinnamon, nutmeg and a dash of cloves in place of the pumpkin pie spice. If you're like me and don't love plain oatmeal, give this recipe a try. It makes a delicious, warm your tummy breakfast that would make my mom proud. In another bowl whisk together the pumpkin, maple syrup, butter, milk and eggs. Add the wet ingredients to the dry ingredients and combine well. Pour into prepared ramekins and top each with 1/2 TBSP of chopped pecans. Bake for 25-28 minutes. Alternately, you could bake this in a one quart baking dish and adjust baking time accordingly. I am linking this to Tasty Tuesday's and Tuesday's at the Table. This sounds like my kind of breakfast I love oatmeal and have it really often, now if only I could convince my husband to try some. I have to make this! Now all of a sudden after years of not liking pumpkin, I love it! Looks like such a fantastic breakfast! This looks wonderful, thank you for the recipe. I can't wait to try it! I found your blog a couple of days ago and am really enjoying it! 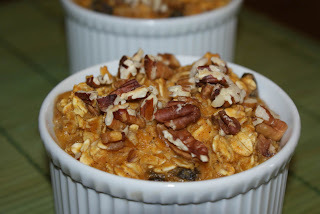 Thanks for sharing this recipe with us, sounds delicious to me, I love oatmeal and pumpkin! one question - is it necessary to cool it down before eating or is it good hot/warm? Your Pumpkin Oatmeal looks so warm and inviting. Thank you for sharing and you have a great week! I would have never thought of enjoying pumpkin this way but what a genius idea! They looks so delicious and oh so comforting. OOOH!! I am not an oatmeal eater, but you got me with this one. Looks and sounds delicious!! Mmm this is the best excuse I've seen to eat something so pumpkin pie-esque for breakfast! And it's totally virtuous too! Delicious. I love oatmeal anyway but this sounds extra delicious! That sounds delicious. I always feel like oatmeal can be improved on, it seems like it has so much potential but is always cooked to death (sogginess, overcooked = cooked to death in my terminology). I made this for breakfast today and it was fantastic! A very bit hit! Thanks so much for another great recipe! I made this for breakfast today and it was great! Thanks for sharing. Merry Christmas and Happy Pink Saturday! !